Fujitsu Reveals First Truly Wireless PC Monitor | OhGizmo! When you sit down at your desktop, how many wires do you see? Or more specifically, how many are running to your tower? Wireless networking, keyboards and mice have all helped us in our battle against the cord, but still there are a few things that remain. Two things that really stand in my way are my speakers and monitors. Fujitsu has a solution for the latter. 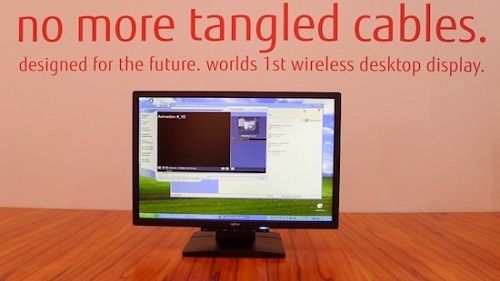 The company has revealed that they are working on a truly wireless monitor. Yes, that includes the power cable as well. The screen gets power using a magnetic induction transmitter, which you would have built into your desk. The video itself would be transmitted from a wireless USB connection from up to 32 feet away. No word when the company will have this ready for stores, or what sort of price we’ll be looking at. and I thought the first wireless monitor was called 'TV'. Well, I did specify “PC Monitor” 🙂 And TVs still have a power cable going to them. This one has no need for cables whatsoever. I wish they'd make a wireless version of one those 7 inch touchscreens. I'd mount it to a gun controller.